Biography: Paul Strand, the son of immigrants from Bohemia (now western Czechoslovakia), was born in New York City on 16th October, 1890. Strand was given his first camera by his father when he was twelve years old. Two years later he joined the Ethical Culture School where he was taught by Lewis Hine, who at that time was involved in a project photographing immigrants arriving at Ellis Island. Strand joined Hine's extra-curricular course in photography. Hine also took Strand to the Photo-Secession Gallery at 291 Fifth Avenue and introduced him to the work of Alfred Stieglitz, David Octavius Hill, Julia Margaret Cameron, Gertrude Kasebier and Clarence White. A member of the the Camera Club , Strand worked for an insurance company after graduation in 1911. However, two years later he became a self-employed commercial photographer in 1911. 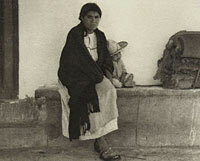 He worked closely with Alfred Stieglitz, who was a strong advocate of what he called Straight Photography. In 1916 Strand's photographs appeared in Camera Work and Stieglitz wrote that "Strand is without doubt the most important photographer developed in this country since Alvin Langdon Coburn." During the First World War Strand was a member of the Army Medical Corps. After the war, Strand collaborated with Charles Scheeler on the documentary film, Mannahatta (1925). Strand continued with his work as a motion picture cameraman when he worked on the film The Wave (1933). With the onset of the Depression Strand became active in politics. A committed socialist, he worked with he Group Theatre that had been formed in New York by Harold Clurman, Cheryl Crawford and Lee Strasberg in 1931. The Group was a pioneering attempt to create a theatre collective, a company of players trained in a unified style and dedicated to presenting contemporary plays. Members of the group tended to hold left-wing political views and wanted to produce plays that dealt with important social issues. In 1935 Strand visited the Soviet Union with Harold Clurman and Cheryl Crawford where he met the radical film director, Sergi Eisenstein. When Strand returned to the United States he began to produce socially significant documentary films. This included The Plow that Broke the Plains (1936), his film on trade unions in the Deep South, People of the Cumberlands (1937) and Native Land (1942). In 1936 Strand joined with Berenice Abbot to establish the Photo League in New York. in 1936. Its initial purpose was to provide the radical press with photographs of trade union activities and political protests. Later the group decided to organize local projects where members concentrated on photographing working class communities. The Museum of Modern Art in New York held a full-scale retrospective of Strand's work in 1945. The Photo League, like many radical organizations, was investigated by the House of Un-American Activities Committee during the late 1940s. This led to members being blacklisted and Strand decided to leave the United States and live in France. Strand published a series of books including Time in New England (1950), France in Profile (1952), Un Paese (1954), Mexican Portfolio (1967), Outer Hebrides (1968) and Ghana: An African Portrait (1976). Paul Strand died on 31st March, 1976. 'Excellent site, featuring an article on Strand's work, as well as several examples of his photography. Article regarding Strand's breakthrough moment in his career.